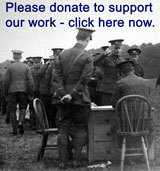 Welcome to the King's Own Royal Regiment Museum's website. It's full of information on the history of the regiment. stories of it's soldiers, as well as sources of further information. You can support our work by making a donation. The Regiment's history is fascinating, at times exciting and often emotional. From 27 September 2018 to 24 March 2019 come and visit our major exhibition on the end of the war and immediate aftermath. The exhibition includes a Victoria Cross, never before on public display, and a manuscript copy of Laurence Binyon's "For the Fallen". The Museum, located within the City Museum, Market Square, Lancaster, LA1 1HT, and is open 10am to 5pm Tuesday to Sunday. Admission is free. Contact us on kingsownmuseum@iname.com We welcome your feedback. The museum receives no funding from the Regiment, the Army or the Ministry of Defence. It is supported by Lancaster City Council. The museum is a registered charity, number 272109.